The Oceanis 48 comes equipped with a mainsail arch, centered mast offering her impeccable balance and a streamline hull for great stability and comfort at all speeds. The combination of these elements is an important step towards agility, safety and flow when living on board. The spacious interior allows up to four cabins or the choice of three cabins with a roomy forward owner’s suite. The cleverly designed shared living spaces, in either contemporary light oak or traditional mahogany, are bathed in ample light from the large hull portholes. The Oceanis 48 is a refinement of innovative evolution making her safe, fast and incredibly comfortable. She is open to all programs, even the most ambitious ones. The 45° companionway is an important characteristic of the latest generation of large Oceanis yachts. 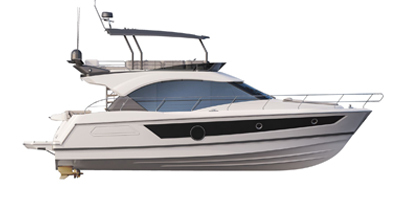 It connects the sizable cockpit with the boat's spacious interior, having a considerable impact on ease of movement and lifestyle on board. The forward cabin, fitted in attractive trim, is a genuine suite furnished with an Italian-style shower. The skilfully designed storage allows for a generous amount of living space, promising a real feeling of prosperity. A set of D4 sails, designed specifically for the Oceanis 48 by the internationally renowned sailmaker, Incidences, is optimized by the German System with which you can trim all sails from the helm station. Beneteau’s partner for over twenty years, this French sailmaker is one of the chief references in competitive sailing circles. Spacious master cabin with ensuite bathroom, separate Italian-style shower. Two large aft cabins with double bed and storage on either side of the beds.